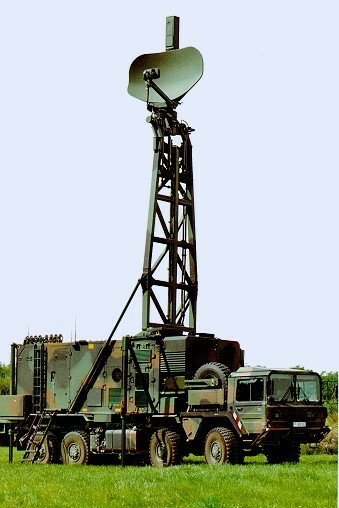 The TRML-2D G-Band radar is designed to be employed as a command and control center for area protection, site protection and the protection of individual military units. The signal processing contains a dedicated helicopter detection function. This ensures the reliable detection of low flying aircraft, ARMS, and slow flying, hovering and pop-up helicopters. EPM features and clutter suppression ensure the detection of small targets even in very hostile enviroment. The highly mobile TRML-2D radar system can be deployed and put into operation within 10 minutes. Up to 40 weapons (lounchers and/or anti-aircraft-guns) can be simultaneously controlled. The TRML-2D including the C² equipment has been deployed with the German Air Force and is employed as a Command and Control Center (FGR) to control the ROLAND missile lounchers. The naval version of the TRM-L is the TRS-C It is a 2-D air and surface surveillance radar for small ship applications. TRS-C is available with magnetron or Traveling Wave Tube (TWT) transmitter and moving target indicator or Doppler processing.